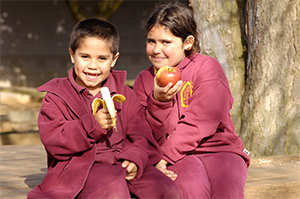 New data from Dental Health Services Victoria (DHSV) shows the dental decay gap is closing between Aboriginal and non-Aboriginal children, with figures showing the smallest gap in nine years of 11.6 per cent. While there are still high levels of dental decay when compared to non-Aboriginal children, the oral health gap between Aboriginal and non-Aboriginal children is steadily closing. In 2008-09, the percentage of children presenting to Victorian public dental clinics with untreated dental decay was 59 per cent for Aboriginal children. Those figures were significantly lower for non-Aboriginal children at 43.3 per cent, a difference of 15.7 per cent. Nine years later there has been a marked closing of the gap with strong reductions in untreated decay for both Aboriginal and non-Aboriginal children. In 2016-17, those figures dropped from 59 per cent to 35.7 per cent for Aboriginal children. Figures were also down from 43.3 per cent to 24.1 per cent for non-Aboriginal children. Over this nine year period, the overall oral health gap has dropped from 15.7 per cent between Aboriginal and non-Aboriginal children to a reduced gap of 11.6 per cent in the latest figures. DHSV CEO, Dr Deborah Cole, said that while there was still a dental health gap between Aboriginal and non-Aboriginal children, significant progress has been made. “We have worked hard to close the gap and our commitment to improving oral health is clear in the positive outcomes shown by these numbers,” Dr Cole said. “Although Aboriginal children still have higher levels of oral disease, the gap between Aboriginal and non-Aboriginal children is closing. Part of that reason is improving access to dental care,” she said. A combination of health promotion initiatives and the important outreach work of DHSV’s Aboriginal Liaison and Community Development officers have contributed to the significant increase in the number of Aboriginal patients accessing treatment in public dental clinics – including children. In 2008-09 a total of 2,338 Aboriginal people accessed public dental services across Victoria and in 2016-17 that number skyrocketed to 10,938 Aboriginal people accessing public dental treatment – a five-fold increase. Health promotion initiatives such as the Bigger Better Smiles education program is partnering with Aboriginal Health Services to build capacity for oral health promotion within these services, contributing to the declining levels of decay in the Aboriginal community.